Today was such a nice an sunny day. I walked Jaani around here for a while, then I went to go have dinner with Ev. She cooked some sort of shrimp and vegetable stir fry. 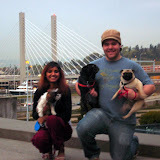 It was good, and then after dinner we took the dogs for a walk on the glass bridge. They don't call it that because it's made of glass or anything, but actually because it has all kinds of glass sculptures, and one end of it leads to the entrance to the Tacoma Museum of Glass. Below is a link to my album for the event. This first video is of the Ceiling inside part of the bridge. The ceiling is made of a single glass pane, with all kinds of glass objects above the ceiling, with natural light from the sun shining through it all. It looks kind of flat from the pictures above and the video below, but I assure you that all the sculptures themselves are 3D, and they are all just laid out in a neat way. The next video is a wall that is set up as a display for glass sculptures. It is over the rail road tracks, which is actually the perfect spot because then you cannot see the train as it passes underneath. I know my commentary is completely awful, but I was trying not to talk because it always just sounds so stupid and dumb. anyway, that's what I was up to all day... or at least part of the day. However, now it is late, and I must get to bed. Talk about bringing work home with me, I put my personal Zune card on my blog. It always brings a chill to my spine when I bring Microsoft and Google social services so close together, but I feel it is appropriate. I have to admit, I do sort of like the concept with Zune Social. The only thing that is really new about it is adding a device that requires the Zune software in order to update it (like I-pod), then they created a Social Network, and have the software used for the device update your profile with listening data. The thing that is actually a little unique is that they created a flash object that can be linked to a profile, then embedded into any page. So... it's over on the right with everything else. well, I guess the title refers to two things, my blog and my trip to Michigan. The first part is because I have been busy setting everything up at home so I can take a picture of what everything looks like all set up, I've been busy at work with a deadline fast approaching, and we are starting to schedule everything for our next big deadline. The second part is because my vacation will take 2 weeks in stead of one. My calendar is updated here: . This is exciting for me to come home... June 26th is the first day I'll be in Michigan. I will be getting in at 1:30 in the morning, so I am sure Scott is the lucky person who will be getting me, however I sent him an invite to be part of my ride home. I am still waiting for him to confirm. Anyway, I will return home on July 8th at about 1:30... or 3:30 depending... I have a connecting flight from Flint to Detroit Metro on my way home, so I guess I can choose between the two. So, now the only thing I need to do is call North West and ask about their policy concerning bringing Jaani on the plane, and to see if they will change the way they handle checked baggage. with a little luck everything will go as planned, but even if I need to, I can just pay for Jaani. It's much better than the alternative. anyway... there is an update... I will leave you with a view from my new apartment. The picture was taken yesterday. It was such a nice day!!!! It was sunny, upper 70's, and it was just in time for me to go buy a fan before they go up in price. Jaani and I spent the whole day on the trail... 'cept for a couple hours we went over to grand view park; yes the view was very grand. So, this is a picture of my view out of my living room. You can see the hills on the west end of the valley. there are a lot of houses out there.. I guess the trees block the view a little bit, but it's actually kind of nice because the people just across the street can't see in my apartment window if I just leave the blinds open all the way. On the other side of the houses is Renton High School. The nice part about that is that they have a large field that is almost completely fenced in. Nobody has said anything about me taking Jaani over there yet. When you lean just slightly over my balcony and look off to the right, this is the view you see. You can see the rest of a small neighborhood, and Renton Municipal Airport is over there a couple blocks down. It's nice because most of the planes take off and land from the other side of the airport, and the Boeing plant is far enough away/out of view so that I can barely hear it when they fire up the big planes. Most of the planes at the airport are small one engine personal aircraft, there are a few larger planes, but they are for the sea-plane tours. So, there is a teaser picture of my apartment. I will start posting interior pictures once I finish actually cleaning everything up. (Right now half of my stuff is still sitting on top of the tables and counters.